Netenberg Products - Classic Fantastico v2.x displays a blank page when accessed in cPanel. How can I fix this? If you get a blank page when accessing Fantastico v2.x, that mean there is an error and the cPanel backend version of PHP is suppressing the error display. Thankfully, this is usually quite easy to fix. If IonCube is not checked in the list, please check it and save changes. If IonCube is checked in the list, please uncheck it and save changes. 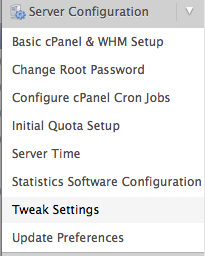 Once the changes are applied, go back into Tweak Settings and enable (check) IonCube and save changes one more time. to make sure the system picks up your changes. If you've tried all of these steps and nothing else works, please open a helpdesk ticket using your netenberg.com user account. How can I update Fantastico F3 if it is already installed?